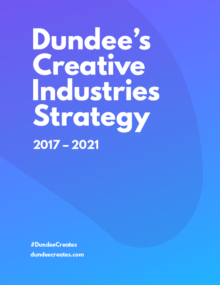 Given the unique opportunities presented at this point in time for the city and its economy, this strategy is crucial to further helping define the ‘Dundee approach’ to supporting its creative sector. This approach is significant, as a city which creates participative ways for its communities to shape and influence how Dundee and its creative sector is defined. Now is the right time to launch this strategy, building on the enthusiasm and energy felt across the city, which was designed to engage the city’s creative communities during Scottish Government’s Year of Innovation, Architecture and Design 2016. Dundee’s Creative Industries Strategy has been initiated by Creative Dundee on behalf of the Dundee Partnership. It has been co-designed with those working/studying in the city’s creative industries sector and the local and national agencies who support the creative industries. Creative Dundee has driven, co-ordinated and produced this strategy through the valuable support of its funding partners, Creative Scotland and Dundee City Council. Dundee’s creative scene is active, connected and ambitious. Citizens and organisations right across the creative industries and cultural sector are supportive of each other and keen to see others succeed. This can be witnessed when you feel the energy walking into many of the city’s creative events, when you discover the strong partnerships that exist between individuals and cultural organisations of all scales, or you explore the progressive approaches being used in Dundee to tackle societal issues here and beyond. Dundee’s Cultural Strategy holds the collective vision and actions for harnessing culture to support the engagement, ambition, achievement, and wellbeing of Dundee’s citizens. 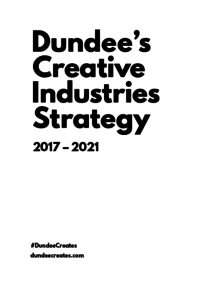 This strategy, Dundee’s first ever Creative Industries Strategy has been collaboratively designed to support those in the diverse creative industries1 who underpin the city’s vibrant cultural sector. With a number of physical transformations underway in the city, including the waterfront redevelopment, and the V&A Museum of Design Dundee opening in 2018, the city will also build on its UNESCO City of Design accolade over the next few years. With increased visitors to the city, these developments have the potential to translate into more opportunities for the creative sector to build sustainable businesses, grow audiences and new markets, and collaborate in new and innovative ways. The city has been described by many in Creative Dundee’s network as the perfect size and location to base a creative business. Its scale offers the ability to walk across the city centre making it easy to connect with other people; and its location means the city is in close proximity to Scotland’s other cities, coast and countryside. With a strong cultural infrastructure including decades of cultural investment, the city is an ideal place for creative practitioners and businesses. Reflect the needs, challenges and opportunities ahead for the city’s creative sector. Explore the best methods of support for the creative sector in Dundee. Ultimately develop a healthy ecology for creative practitioners and businesses to be based. Scotland’s creative industries sector contributes £3.7 billion GVA3 to the economy annually and it is characterised by small businesses – 87% of them have less than 5 employees. The creative industries are one of the fastest growing industry sectors in the UK, and Dundee is increasingly being acknowledged as defining the strategy for other global cities in how it harnesses creativity and cultural resources to develop a better, more connected city. The city needs to ensure this perception is matched by the reality. This strategy is a short document which aims to complement other relevant city strategies led by the Dundee Partnership and the local authority, such as Dundee Cultural Strategy 2015 – 2025, Economic Strategy And Action Plan 2013 – 2017, Dundee’s Tourism Action Plan, Dundee’s Music Strategy 2017 – 2019 and the Single Outcome Agreement for Dundee 2013 – 2017. It also aims to complement the strategies of the national agencies who support the creative industries, including Creative Scotland’s Creative Industries Strategy, Scottish Enterprise, Skills Development Scotland and Scottish Funding Council. This strategy was initiated by Creative Dundee on behalf of the city and has been co- designed with those working/studying in the city’s creative sector and the local and national agencies who support them. Creative Dundee has strong links to the creative sector and agencies and has previously initiated a number of projects which engage citizens in new ways of shaping their city and influencing how its story is shared. Discussion for the strategy was facilitated through a project called Fabric Dundee, which comprised a series of workshops, one-to- one interviews with local creative businesses and a study visit which ran throughout 2016, all involving people from the city’s diverse creative industries. A series of themes emerged around spaces, skills, resources and connectivity, which helped inform the discussions and were valuable in showing how creative initiatives developed, matured and succeeded or failed. The group agreed that for the strategy to be adopted, the actions would have to be driven as much by people who are actively interested in the direction of the city, as by the agencies who support the creative sector. A Creative Industries Dundee Stakeholder Group was formed and chaired by Creative Dundee, bringing together representatives from the local and national agencies who support the creative sector. This group has focused on the opportunities and challenges for the city’s creative sector, through bi-monthly meetings since November 2015. Prior to the development of this strategy, Creative Dundee has also led a number of meetings, workshops and public consultations about the needs and challenges of creative industries based in and around the city. People – passionate, committed and ambitious – are our city’s most valuable assets. The energy found in the creative community is unique. It nurtures others and continues to generate opportunities for the sector and city to thrive. The feeling of connection and belonging is important, as is a strong social justice ethos – people are keen to include, collaborate and make an impact in their city. These values resonate with the Scottish Government’s economic strategy supporting the 4I’s in the economy of Investment, Innovation, Inclusive growth and Internationalism; and also with Creative Scotland’s Triple Bottom Line approach – understanding that creative businesses have a strong understanding of community interest as well as commercial ability, and have an impact on economic, social and cultural value. Working collaboratively – through peer sharing and learning. resources – knowledge, spaces, and other assets. unlock resources and create opportunities. Embracing play and experimentation – trying, failing, learning and trying again. creative sector and connecting with the city’s diverse communities – to spread and share aspirations. the city offer huge opportunities to be responsive and progressive. The consultations revealed three key areas impacting those working within the creative sector, across disciplines and career stages. The following sections outline the current challenges, a summary of the identified needs, recommended actions and benefits. How can the city develop a nurturing environment that ensures creative practitioners and businesses from all backgrounds can succeed? With a large creative student population, a significant challenge for Dundee is encouraging its students from the city’s schools, universities and college to have the confidence to base their professional practice in Dundee, upon completing their studies. Institutions and students are often disconnected from the local creative sector. The research and consultation found that students themselves felt that the city lacked sustainable local opportunities of meaningful scale which were attractive enough to encourage them to stay and be rooted in Dundee beyond graduation. Students often want to stay, but feel forced into leaving to find opportunities elsewhere, they are reluctant leavers. The city’s institutions must encourage diverse routes into the local creative sector, supporting people either to create their own pathways towards establishing a creative business, or finding employment. Ensuring students and those who support them are aware of the opportunities locally will equip graduates to make informed decisions on where to base their practice. Sharing sectoral perspectives from established creative businesses across key disciplines, such as games, fashion, music and design are valuable for providing city-wide role models and mentors. Some creative sector employers, particularly within the games industry, struggle to attract staff who have well established lives elsewhere. Therefore, encouraging the development of sustainable creative businesses of scale; alongside building the perception of the city and its creative sector nationally and internationally will be crucial for Dundee to be recognised as a potential base for creative businesses and employees. If the city’s creative sector is to develop and match the expectations of a growing and rapidly changing city, support must be in place for creative practitioners, grass-roots organisations and businesses who are potentially undervaluing their products or services, or have not yet considered the opportunities associated with the city’s transformation. Meeting these challenges require a city-wide rethink of the infrastructure, support and progression routes from education, through to gaining employment, or starting and growing a creative business. Meeting these challenges require a city-wide rethink of the infrastructure, support and progression routes from education, through to gaining employment, or starting and growing a creative business. Strengthen the connection between students, academic institutions and the local creative sector. Support the development of sustainable creative businesses/practices. Maintain and develop networks to enable established creative businesses from different disciplines, including games, fashion, music, visual and performing arts and design, to share perspectives and to provide role models and mentors for young professionals. Explore current creative employment opportunities within the sector, so that career progression routes and pathways can be more clearly defined. Build awareness beyond the city of Dundee as a viable creative base. Grow the opportunities and pathways for creative practitioners and businesses to base themselves in Dundee. Develop city-wide mentoring, internships and shared apprenticeship programmes. Build awareness of Dundee as a thriving creative hub. Encourage equality and greater diversity in the creative sector. Raise awareness of creative sector opportunities within further and higher education. Grow understanding of skills required to start, run and grow a creative business. A thriving city which attracts, retains and exports innovative creative leaders; and an increased number of sustainable creative businesses. 1. Develop city-wide mentoring, internships and shared apprenticeship programmes which generate employment opportunities for young people and support creative sector growth. Identify potential models for delivering internships and apprenticeships e.g. open badges, paid opportunities. Pilot approaches in the city. Seek potential funding for paid internship scheme. Support programmes of collaboration across creative disciplines. Increased number of young creatives staying in or returning to the city. Increased awareness of the diverse roles available in creative organisations. Increased co-working/collaborative outputs in the city. Lead: Cultural Agencies, Developing Young Workforce Team. Supporting: Creative Scotland, University of Dundee, Abertay University, Dundee & Angus College, creative businesses. 2. Build awareness nationally and internationally of Dundee as a thriving creative hub, with a strong, innovative identity. Use existing memberships such as UNESCO Creative City Network and digital platforms to enable greater international connections to share experience and success. Analyse existing marketing/ promotional activity, look at ways in which the creative sector can feature more often or add more. Identify key markets and messages. Engage with national and international networking opportunities e.g. Pecha Kucha, Design Jams, EU initiatives, academic conferences. Support designers to engage with the opportunities offered by UNESCO Creative Cities membership. Promote digital presence, use social media and live streaming effectively. Develop creative sector ambassadors for the city. Attracting new talent to the city. Retaining graduates and early-stage creative businesses. Enhanced profile of Dundee as a creative city – attracting visitors, students and investment. Increased number of ambassadors promoting the city – existing businesses and students; those who have moved on from the city. Existing promotional activity used more effectively, tailored messages for the creative sector. Lead: Dundee City Council, Creative Dundee. Supporting: Cultural agencies, University of Dundee, Abertay University, creative businesses. 3. Encourage equality and greater diversity in the creative sector. Create case studies which showcase greater diversity across the sector. Share sectoral perspectives across key disciplines. Greater diversity across the creative sector. Supporting: schools, Dundee & Angus College, University of Dundee, Abertay University. 4. Employers in the creative sector to support the Scottish Living Wage and create career path opportunities within the creative sector. Promote the Scottish Living Wage amongst cultural and creative organisations across the city. Support creative practitioners to price their services/products effectively – appropriate price points. Promote best practice in engaging freelance staff and procuring creative skills. More creative businesses are sustainable. More creative/cultural organisations have signed up to become Scottish Living Wage employers. 5. Schools, Dundee & Angus College, University of Dundee, Abertay University and cultural organisations raising awareness amongst young people of the creative sector – opportunities and events. Identify key contacts in cultural and educational organisations to act as brokers to industry/creative sector. Develop events to promote opportunities in the sector to young people. Raise awareness amongst guidance teachers of the roles within the creative sector and routes into those roles. Promote cultural/creative events amongst young people. Raise awareness amongst students and young people of the potential to establish a creative enterprise. More young people choosing creative sector subjects. More young people participating in creative events, courses and skills development. More cultural organisations providing opportunities for young people. Appropriate routes for sharing information identified. Lead: Dundee City Council, educational institutions, cultural agencies. Supporting: Cultural Enterprise Office, Business Gateway, Creative Dundee. 6. Greater understanding of the skills required to start, run and grow a creative business, including the development of new business models such as creative hubs, co-ops and collectives. Develop a programme of skills development at key stages of the creative business life cycle – start up, ramp up and growth. Pilot new business models in the city. Identify existing creative hubs, hot desking, collectives and gather information on their experiences. Increased number of creative start-ups in the city. Increase in number of work spaces for the creative sector in the city. Lead: Business Gateway, Dundee City Council, Cultural Enterprise Office, Creative Dundee. Supporting: Creative businesses, academic intuitions. 7. Collate data on the creative sector to support understanding of the sector, its needs and the opportunities it presents. Identify data held, data needed, how to collect it. Establish a methodology for collecting data. Liaise with other growth sectors. Baseline data established to provide a starting point for monitoring outputs and achievements. Data available with which to sell the sector. Better understanding of the sector. Supporting: Creative Dundee, Cultural Enterprise Office. A podcast series celebrating the thoughts, opinions and journeys of creatives connected to Dundee. Independent creators who make, collaborate, educate and play in digital cultures. GENERATORprojects’ ‘They Had Four Years’ features work by recent graduate artists and showcases their developing practice. As the creative sector has a lot to offer society and the economy,how does the city develop the conditions for these collaborations to emerge? The city has significant strengths and expertise which should be harnessed to develop Dundee and its surrounding region, and be an international exemplar for other similar sized cities. Of those recorded as working in Scotland’s creative sector, 87% are micro-businesses with fewer than 5 employees; many more are independent freelancers, sometimes working in isolation. Although Dundee has a strong and well-connected creative ecology, some people are keen to further develop opportunities to collaborate with others, combine skills and learn from each other. Identifying sectors which could benefit from collaborations and partnerships with the creative sector will be valuable for exploring new and emerging practice. Within Dundee there are vibrant life sciences and healthcare sectors, a rapidly growing service sector, and a large number of public, charitable and third sectors who are all doing important work. Over the next few years, the anticipated increased numbers of visitors to the area offers significant opportunities for cultural tourism, which is increasingly recognised as a vital tool for place-based regeneration. By combining the creative and tourism sectors’ expertise through targeted support, Dundee will provide high-quality, world-class visitor experiences. These cultural products and experiences with provenance to the local area have the potential to increase visitor spend and stays, and inspire the next generation of creative businesses. Finding ways to create authentic cultural tourism experiences will also be critical for the success of the city and the wider region’s offer. The city has good national and international links, although these are not always visible. Therefore more awareness-raising is needed, along with encouragement of the value and benefits of working with external partners. Profiling the city’s creative sector at national and international events and making better use of global networks, such as the UNESCO Creative Cities Network, are critical. As a recognised hub for digital technologies, 4 Dundee should create the space for experimentation and new ideas to form in a wider context than educational institutions, and beyond the development of traditional digital products – thus building awareness of the city as an international creative technology hub. Digital platforms offer innovative ways of the city connecting with practice internationally. These should be fully explored to share the city’s stories and ways of working with the world. Identify key sectors such as healthcare and life sciences which would benefit from collaborative opportunities with the creative sector – map and understand where this is already happening well in the city. Increase the connections between the city’s artists and designers and the third sector. Develop the city’s cultural tourism offer as a city to visit, stay in and invest in. Build opportunities to ensure Dundee continues to be recognised as an important creative technology hub, nationally and internationally. Build on the city’s strengths and expertise to develop innovative new approaches to supporting the local economy and society. Run an annual programme of events focused on building and maintaining effective connections between the cities creative community. Encourage the development of high-quality cultural tourism products. Develop inclusive approaches to engage citizens in the city’s creative sector activities. Changed perception of how Dundee’s creative sector can impact the city locally, and is recognised on a global platform for its confidence, ambition and progressive approaches. 1. The creative sector to be better connected, with improved networking opportunities within the sector and with those in other sectors, creating new business opportunities for creative businesses, non-creative businesses, the third sector and the public sector. Develop events which aim to engage the organisations within the creative sector and across sectors. Engage the third, public and private sectors in creative approaches (e.g. design-led) to development of new services/products. Increased cross-sectoral working in the city, creating more opportunities for the creative sector. Development of new products, processes and services through collaboration/convergence. Enhanced networking within the sector and across sectors – events etc. Lead: Dundee City Council, Creative Dundee, V&A Dundee. Supporting: Local and national agencies. 2. Dundee’s creative sector provides high-quality cultural products, services, events and experiences as a key offer for visitors to the city. Identify key selling opportunities for creative businesses. Raise awareness of cultural tourism and the cultural tourist and the future opportunities in the city for creative businesses. Support the development of products for cultural tourism. Visitors spending more money and time in the city as a result of an enhanced cultural tourism offer. More creative businesses engaging with cultural tourism. Increase in the number of cultural tourism products offering unique/ authentic experiences for visitors. Lead: Dundee City Council, Creative Dundee, creative businesses. Supporting: Scottish Enterprise, Cultural Enterprise Office. 3. More people across the city are engaged in/with the creative sector through events, experiences, services and products. Engage citizens with the European Capital of Culture bid. Ensure the Creative Industries Strategy and the city’s Cultural Strategy are working together to deliver. Increase in the number of Dundee citizens participating in creative/ cultural activities. Series of events/activities to engage local people developed. Lead: Cultural organisations, creative businesses. 4. The city’s identified UNESCO Design Values are recognised and adopted by organisations and companies to support the growth of the creative sector. Work with the UNESCO team to develop awareness of and engagement with the values. Support local companies to engage with the design/creative sector through networking, awareness and opportunity. Support the development of V&A Dundee’s Design for Business model. Local creative companies engaging more effectively with other companies – being commissioned and procured for creative services. Lead: UNESCO City of Design Team, V&A Dundee. A five-day celebration of design which brings together some of the world’s leading makers and thinkers, in UNESCO’s first and only City of Design. The MIX IN is an event designed to inspire and develop collaborations around cultural tourism across the Dundee and Angus region. Bringing street art to Dundee, Open/Close is injecting life to the alleyways and forgotten corners of the city centre. Resources are tight for everyone, so how do we join forces and find economies of scale to unlock our potential to achieve? Dundee’s creative economy is innovative and vital to the city, yet is still fragile. Like other cities it has limited access to available spaces to make, perform, show and sell work. are at the heart of progress and development. The creative sector has made great progress in bringing to life redundant spaces in the city (Fleet Collective, Tin Roof, Generator Projects), but needs real effective partnerships with the public and private sector to continue this work. Fleet Collective is an important example in the city of a collaborative space initiated by a creative collective with a landlord which is working well – case studies like Fleet should be amplified to increase the understanding of the value of these partnerships for both creative communities and property developers. There is a need in the city for both temporary suitable spaces (for making, performing, exhibiting and selling work) and mixed-purpose, alternative spaces (for experimentation and the development of new collaborations). Both the creative and property sectors could benefit from greater communication and understanding through regular meetings and events to develop new strategies which tackle common challenges of empty and under-used spaces. The size of the city and the strength of connections between cultural organisations and individuals also creates a unique potential to work more closely together. This offers an interesting way to share and benefit from pooled and shared city-wide resources – such as smaller emerging creative practitioners benefiting from working with larger established cultural organisations. The creative sector has a culture of flexibility, collaboration and partnership working, so opening dialogue to develop partnerships that improve access to space and resources should be a priority. The city’s technology sector requires access to affordable high-speed broadband which is not always available. This has been highlighted in the strategy consultation as an issue that needs to be addressed to ensure Dundee continues to be recognised as a renowned digital hub. Enable better use of property space for creative use. Create a city-wide support scheme for skills/resource exchange. Ensure access to high-speed and affordable internet for creative businesses. Access space and resources to develop innovative ways to open and share. Understand the challenges which are preventing creative practitioners from bringing redundant and under-used space into productive life, and build these into long-term property development plans. Develop a three-year plan and audit of under-used property with potential to support the creative industries to determine the best solutions of temporary use of space in the city. Create case studies of partnership projects which have used space and resources well in the city to highlight opportunities to other developers/property owners. Build initiatives which offer ways for the cultural sector, creative practitioners and creative businesses to share resources and benefit from collective working. Increased experimentation and trialling of initiatives for collective city-wide impact through developing new forms of collaborative working and shared spaces across the city. 1. Ensure that both the public and private sector are aware of the property needs of the creative sector and that the creative sector can access and manage appropriate, innovative property solutions to support their needs: working, selling and showing. Identify the property needs for the creative sector at various stages of business – start up and growth – share with property owners. Engage the creative sector, planners and property owners in discussion about needs and opportunities. Provide the creative sector with an overview of the property sector – legal requirements, rates & rates relief, health & safety. Undertake research into the re-use/ temporary use of vacant spaces. Support the development of hot-desking, co-working spaces. Research opportunities for selling and showcasing products, services and events. More creative businesses are able to find appropriate and affordable property solutions. Creative sector establishes new working spaces in the city. New selling and showcasing spaces identified – pop-up and more permanent. Lead: Dundee City Council, Creative Dundee, creative businesses, property owners. 2. Create a city-wide ‘support scheme’ addressing skills exchange and/or resource sharing between cultural/creative organisations and individual practitioners. Undertake an audit of resources in cultural organisations that can be shared – physical and skills – sharing directory. Develop a protocol for sharing resources and skills – the sharing economy. Smaller cultural organisations and creative businesses accessing skills and resources from larger organisations to help them grow. Lead: Cultural organisations, Creative Dundee. Supporting: Creative Scotland, Dundee City Council. 3. Ensure access to high-speed and affordable internet for creative businesses. Work together to identify needs of the creative sector and current/planned status of internet provision across the city. Look at alternative models of provision. Creative businesses are able to access affordable high speed broadband. More of the city is covered by high speed broadband. Lead: Dundee City Council, creative businesses. Dundee-based producer and promoter Sweet Venues has joined forces with Dundee Rep to present a series of monthly ‘Lates’ in the Rep’s pop up space. Fleet Collective is a creative co-working space full of talented people making awesome things, sometimes on their own and sometimes as a group. Dundee is a city of strong partnerships, and the recommendations and outcomes detailed within this strategy will only be achieved through the collective action of organisations and individuals in the city and beyond. Creative Dundee would like to thank everyone who contributed so enthusiastically in the Fabric Dundee sessions; also to those who shared their views in the online survey, or took part in any consultation events or interviews. Thank you also to the Creative Industries Stakeholder group for their support in developing the strategy including: Creative Scotland, Dundee City Council, Leisure & Culture Dundee, UNESCO City of Design, Scottish Enterprise, University of Dundee, Abertay University, Dundee & Angus College, V&A Museum of Design Dundee, DCA, Dundee Rep, Scottish Dance Theatre Limited, Cultural Enterprise Office, Tayscreen, Wasps Studios, Elevator and Skills Development Scotland. This strategy was endorsed by the Dundee Partnership Work and Enterprise Board on 23rd May 2017. Strategy co-ordination and writing team: Creative Dundee – Gillian Easson, Claire Dufour and Sam Gonçalves. Design and digital development: Fleet Collective. Audio recording: Gillian Easson, Claire Dow, Sam Gonçalves and Su Shaw. View the 14 poster locations across the city which feature quotes from contributors and accompany the Strategy launch here. Our staff (now and in the past) travel long distances daily to work with us as we do specialist work. It’s fantastic they do but it would be great to have people more locally too. This will take some time to build along with the reputation of the city showcasing what is already happening…. building confidence…. I was thrilled to get the opportunity to move back to Dundee after graduating from DJCAD a few years ago. At the time of graduation there felt like a lack of opportunities did make most of us look for roles elsewhere. Especially if you wanted to gain experience in a larger creative agency or organisation. As a new lecturer at DJCAD and new inhabitant of Dundee i am very keen to help strength the links between academia / students and the city’s cultural sector.